Statistics show that, on average, U.S. companies lose half of their customers every five years. 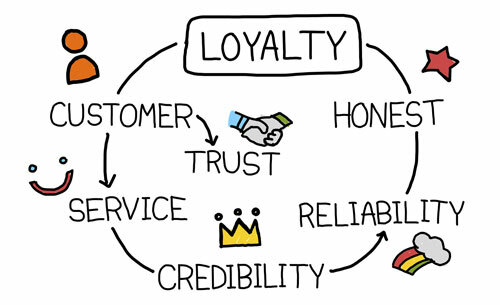 Here are a few ways to keep your customers loyal. It’s true that acquiring new customers will help your business grow. However, your current customers are the lifeblood of your business and keeping them happy should be your highest priority. Here are six ways to improve your customer loyalty. Many business owners mistakenly believe that customers choose to patronize other companies solely because of better prices. While pricing can be a concern, customers often head to the competition when they don’t feel valued. Maybe it’s reliability or speed or cost. Your company should know your clientele’s No. 1 priority and consistently deliver it. Remember, customers’ desires change frequently, so re-examine this every six months. The lifetime value of your customers is the income you would gain if a customer stayed with you as long as they possibly could. Good first impressions tend to generate loyal customers, and you get only one chance to make a positive first impression. Appearance is important. The exterior and interior of your business should be neat and clean. Employees should listen actively to customers. Reassure your customers that you genuinely want to help them. Customers will judge your business based on the politeness, empathy, effort and honesty of your staff. Inevitably, your employees will encounter unsatisfied customers. Whether they’re returning an item or changing a service, customers expect a fair policy. If you cannot offer a resolution immediately, let the customer know when he or she can expect an answer.